Samples of beef dripping and plant oil-based deep-frying fat were obtained from fast-food premises in Christchurch, New Zealand, as well as samples of deep-fried battered fish and potato chips. The fat in these samples was analyzed for level of oxidation by measuring acid value, peroxide value, polar compounds, thiobarbituric acid-reactive substances (TBARS), and conjugated dienes. The acid and peroxide value results were contradictory when compared with limits set in the New Zealand Food Regulations 1984, but the levels of polar compounds were generally below 25%, indicating that the fats were well maintained. 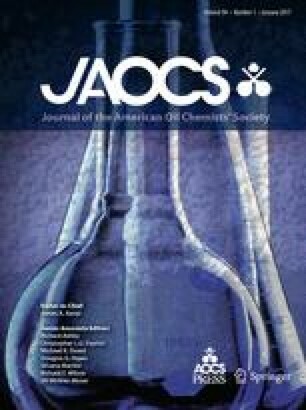 The TBARS and conjugated diene levels were compared with those for oxidized corn oil used in a feeding trial and indicated a similar oxidation level, although the amount of fat consumed in the feeding trial would be 30–50% higher. These results show that well-maintained deep-frying fat has oxidation levels sufficient to cause elevation of plasma lipid oxidation levels as observed in a human feeding trial.